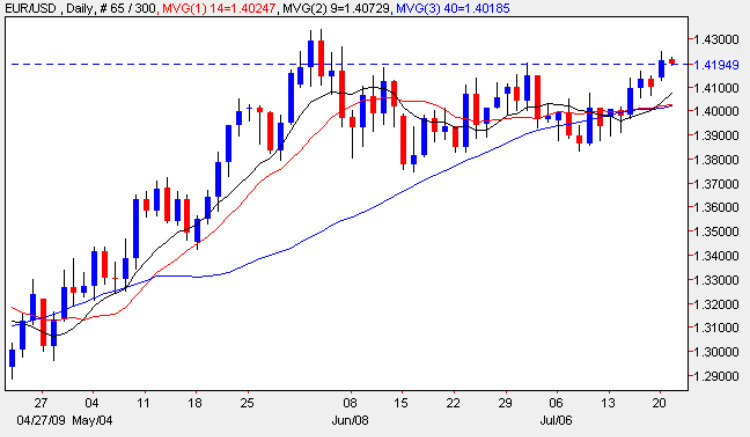 Yesterday’s up bar on the daily chart for the euro vs dollar, added further weight to the prospect of a breakout above the key 1.43 resistance level, which is now firmly in sight, with the candle having closed the trading session with as a wide up bar and a small upper wick. With the 9 day moving average having crosed above both the 14 day and 40 day averages, this would seem to confirm this analysis, but much will now depend on the fundamental picture which is painted by Fed Chairman Ben Bernanke over the next two days, as he gives his testimony before the House Financial Services Committee and the Senate Banking Committee in DC. Bernanke’s testimony will be on past, current, and future Fed monetary policy (interest rates to you and me), the budget deficit, sovereign debt monetization, future stimulus measures for the economy, and the prospects of a sustainable and realistic recovery in the equity markets, and as always all his comments will be closely watched for any signals and clues. The testimony usually comes in 2 parts as follows : first he reads a prepared statement (a text version is made available on the Fed’s website at the start), then the committee will hold a question and answer session. Since the questions are not known beforehand they can create unscripted moments that can often lead to heavy market volatility, and the next two days of testimony could set the tone for the markets for the next few months.With no news in Europe today, this is the main focus for the euro vs dollar today, and the currency pair will no doubt drift until the New York open and the start of the session in Washington.